I think you're being a little harsh on this story, which I rate as by some distance the best one so far -- largely because Doc Ock is by some distance the best bad-guy. (When The Vulture returns a few episodes later, I simply sighed. When Doc Ock returns, it's a big moment.) I also think it's not impossible that the Torch's little never-give-up speech affected quite a few kids back in the 1960s. That said, the last time I read this story before my present re-read was after seeing and loving the Spider-Man 2 movie, and on that occasion I was struck at how inferior the story is in every respect to the film version: in the villain's motivation, his origin story, his plans, and in Spidey's resourcefulness. At exactly the same time, of course, on the other side of the Atlantic, the Beatles were reinventing popular music. What a time. Bliss it must have been it in that dawn to be alive, but to be young would have been very heaven. Yeah, I have to agree with Mike. This story seems clumsy and a bit dopey because we're reading it after 50+ years of incremental improvements have dramatically raised the game. In 1963 it would have been a lot more impressive. 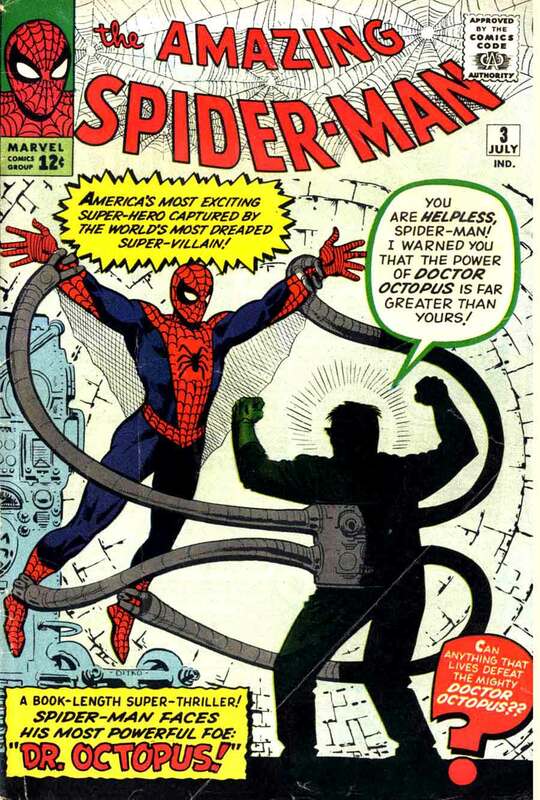 Doctor Octopus is the first of several villains who are recognizably inversions of one or more aspects of Spider Man. He's a brilliant scientist, but physically unattractive -- short, fat, with strange thick glasses. His powers, like Peter Parker's, are a combination of "gained in an accident" and "brilliance of his own design". His powers echo Spider-Man's -- wall climbing, strength, he is his own web and he sits at the center of it. 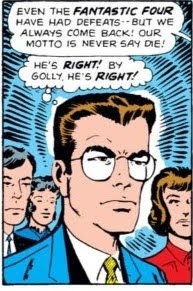 And he's inverted obvious insecurity into an immense ego -- what is channeled into relatively harmless wisecracking and mockery in Spider-Man is something mad and monstrous with Doc Ock, but it's clearly tapping the same wellspring. The villain who appears here is just a crude sketch, and you can see Ditko struggling to figure out how to use him visually. But right from the beginning, the potential was there.